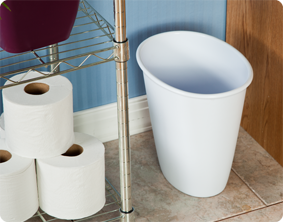 The 1.5 Gallon Oval Vanity Wastebasket combines a small footprint with a narrow profile. This discrete wastebasket is the perfect option for use next to a desk in an office, by the sink in a bathroom or kitchen, in the bedroom or stored in a craft room where narrow spaces require a space-efficient solution. A clean, oval aesthetic and modern design combined with a textured exterior and polished rim coordinate with any home, office, or bedroom décor. This item offers a tight nesting design and offers a 1.5 gallon capacity. This wastebasket also accommodates a standard plastic shopping bag. The overall dimensions of this item are 10 1/8" L x 7 1/2" W x 9 3/4" H.
Overall Assembled Size: 10 1/8" x 7 1/2" x 9 3/4"
Perfect for narrow spaces that require a space-efficient option. 1.5 Gallon Oval Vanity Wastebasket is rated 4.6 out of 5 by 9. Rated 5 out of 5 by cjbg1980s from Great Small wastebasket Great Small wastebasket, easy to clean and fits anywhere due to its small size. I use it in my bathroom and have had it for several years. 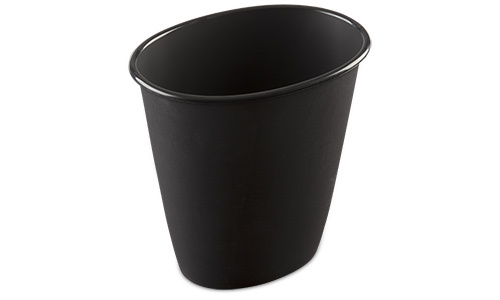 Rated 5 out of 5 by FBmom from Simple but Efficent This wastebasket is perfect for it’s intended use. The brand represents the quality of the product well. It’s nice because it’s not only in basic white but black which I personally love! Rated 5 out of 5 by DWilson from I highly recommend! I have several of these trash cans throughout my home. They are perfect in size to use in bathrooms, bedrooms and home office. They aren't very big but big enough to do the job and they fit well in small spaces. The color options give you the opportunity to match any decor. They are pretty durable for the price as well. They are also easy to clean. I highly recommend this product. Rated 4 out of 5 by Malinda1 from Perfect Size I was looking for a wastebasket that was small and discrete and this is perfect. I use it under the sink where it fits perfectly but looks nice enough to fit in the small corner of my bathroom. The one I purchased has a textured finish to it which can be a bit tricky to clean on those few occasions that something I'm putting the trash spills a bit. I would certainly recommend this to anyone. Rated 5 out of 5 by svwhy1461 from Compact but gets the job done This trash can works great in our bathroom. Because the dogs won't stay out of it it fits perfectly on the back of the toilet. I find it holds enough to only need to be emptied once a week when the trash goes out. Rated 5 out of 5 by Cogal83 from Absolutely my fav! We love this because it is affordable and super durable with having two boys! They last forever! A great trustworthy company that makes great products! Rated 4 out of 5 by Kris from Small & light duty Fits well in tight spaces (between the toilet and the vanity or next to the dryer). Needs emptied a few times a week in a busy bathroom, but that's fine with me - I don't want to store trash in the bathroom. (Good size for folks who "swish 'n swipe" daily.) I also use one of these in the laundry room for dryer lint & pocket debris. Because of the tapered shape, it's a little tippy - if the trash bag isn't quite all the way open, trash hangs up at the top and the can wants to tip over. Easily solved by making sure the bag is all the way open, pushing trash down, or putting something heavier at the bottom (like the roll of empty bags). Also fits in my dishwasher for easy cleaning/sanitizing. 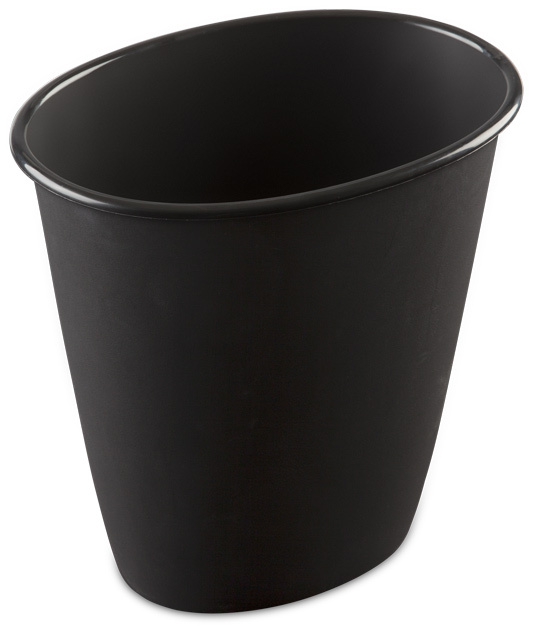 Rated 5 out of 5 by svwhy from Great fit for small spaces This wastebasket works great in a small area. It doesn't hold as much as my old round bathroom wastebasket but it still does the trick and fits much better on the back of the toilet (we have dogs that get into the trash if we leave it on the floor). The white color goes with most everything.